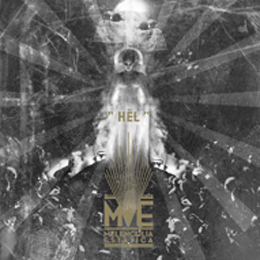 Hel is slightly comparable to 2008’s Letum (and the nameless debut as well, as a matter of fact), and lasts for forty one minutes. It is an amalgam of fierce and blasting Black assaults, including slower parts, acoustic intermezzos, ambient interludes, Death Metal-laden riffing, and Dark / Funeral Goth-atmospheres. The approach is slightly chaotic and rather primitive, but this isn’t but a wonderful underground interpretation of musical decadence with, and that’s one of the surpluses, a clear, coherent musical vision. More than on Letum, Hel breathes a specific Nordic mist, decreasing the border with the Norwegian and USBM-scene. But, of course, for Melencolia Estatica are an Italian act, the whole complex comes with that mystic, mysterious approach, rather creepy and spiritual than brute or battering. Not that original for this kind of constellation is the diverse vocal range: deep, powerful grunts and screams (mainly by a certain Afthenktos), whispers, melancholic chants, sorrowful sighs, female voices and epic choirs. But it’s another characteristic for the Italian scene, and another element that makes that South-European country so particularly interesting when it comes to abyssal grimness. Finally this: the drum parts have been done by Gionata ‘Thorns’ Potenti, one of Italy’s most active (Black) Metal musicians (active, former or session member of tens of bands like Ad Hominem, Kult, Silva Nigra, Tundra, Deathrow, Glorior Belli, Handful Of Hate and many, many others! ).